While a light rain shower (or even an isolated thunderstorm) is possible up in the mountains Wednesday afternoon, the overall weather picture calls for dry and mild weather through the rest of the week. The ridge of high pressure responsible for the “mild” is flat enough to allow a weak low pressure center to move into southern California, which could help spring a few mountain showers mainly south of Lake Tahoe. It will also allow a few clouds to drift across the region, but it is unlikely we will see any precipitable benefit from them here in the valleys. Photo Courtesy Jeff Houk. Taken Sunday (March 15) 7:02 am over Reno, NV. 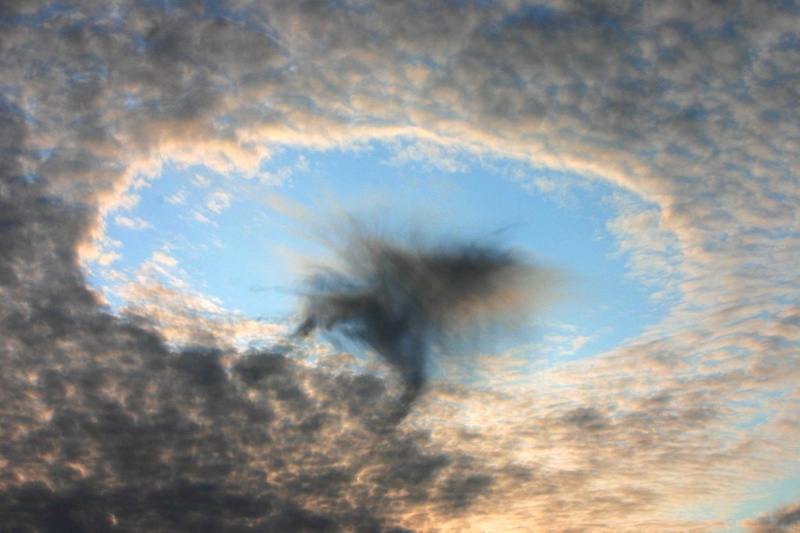 The hole-punch cloud is usually seen in a cirrus or alto cirrus cloud. Something will happen (usually a jet flying through it) which provides a nucleation site and all the extra moisture condenses and starts to drop out. A lot of times it will evaporate before reaching the ground and you have a “dry hole” in the middle of your cloud. In this case, I doubt it was started by an aircraft, but its position right in its center tells me something. 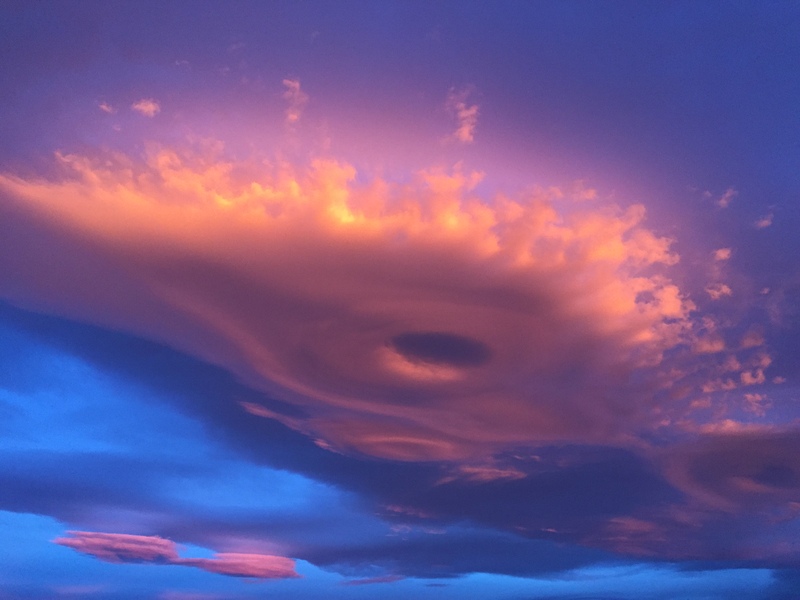 In a Sierra Wave cloud (a standing lenticular cloud) the center of the top of the cloud is its highest (and therefore its coldest) point. In this case, I think there was enough moisture so that the very top of the cloud began producing precipitation, which caused downdrafts, creating warming and drying where you see it in the picture. It’s a “mesohigh” similar to the feature you get in the eye of a hurricane, or sometimes under a thunderstorm downflow. Any way you look at it (or explain it), it could be the coolest local cloud picture ever sent in to me. Pingback: Spaceship Lenticular Cloud – Maybe the Coolest Cloud Picture Evah! | Watts Up With That? Beautiful photo. Mike, I’m going to hypothesize that the airflow over the top of the “wave” is causing compression in the airflow directly beneath the wave peak. Change in pressure will result in a change in temperature causing a rise in the elevation of the dewpoint in that immediate area, hence the “dimple”. I think another name for the phenomenon you use to explain the hole is a ‘fall streak’ but in this case the streak is not visible. A Fallstreak Hole is another name for a Hole Punch, although I like the latter better because it is more descriptive. The problem with a fallstreak phenomena as described is that the winds are blowing. Moisture won’t fall straight down from the thickest part of the cloud. It will follow the airflow towards the downwind edge of the cloud and show up there. Keep in mind the hole isn’t caused by an absence of moisture…and in fact the “hole” doesn’t penetrate the whole cloud. It’s caused mostly by a column of descending air (downflow) starting at the top of the lenticular. That descending column of air tilts with the wind and punches out through the bottom, causing an area of warmer air where it comes out (adiabatic heating.) that raises the elevation of saturation up a few hundred feet under that descending air column, creating the hole. You can see the hole doesn’t penetrate through the entire cloud. I’ve never seen a lenticular cloud that looked like this! I could only find one other similar picture on the Internet: http://ow.ly/KwYHo I wonder without the bright color and low sun angle, the hole might even go unnoticed. Neat photo. I have a different hypothesis about what caused the hole: Ascending air caused by the latent heat released by water droplets turning to ice crystals above and, of course, upwind of the hole. This warming would pull dryer air up into the cloud and form the hole. Conversion from water to ice can occur when a higher layer in the wave cloud becomes cold enough (about -26 C) to convert super-cooled water droplets to ice crystals, or perhaps is “seeded” by material upwind to convert water droplets into ice crystals at a warmer temperature. The process of causing the release of latent heat is called “dynamic cloud seeding” where water droplets that that change into ice crystals release latent heat, and the latent heat causes an updraft. Dynamic seeding happens fast enough to cause an updraft whereas there is insufficient time for the small 20-micron droplets in a wave cloud to form large enough droplets or ice crystals to precipitate. By the way, I was chief scientist for the Desert Research Institute’s airborne research facility from 1965 to 1971, and the only civilian participant in Project Popeye where we taught our B-52 pilots how to “dynamic seed” local clouds to wash out the Ho Chi Min trail. Thanks Ed…Here’s the problem I have with your hypothesis…If the hole is drawing air up into it, it wouldn’t make an indentation…it would instead make a protrusion of cloud sticking down out of it. Remember…clouds are formed where the air is ascending, and they disappear where air is descending. it may seem counter intuitive, but that’s how clouds form. 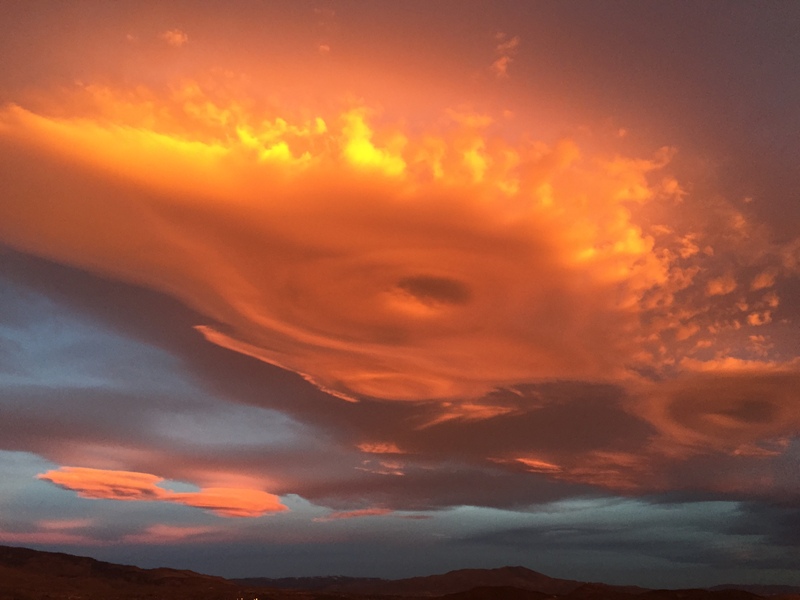 Look at the formation of the lenticular itself… the leading edge of the cloud grown to the thickest part of the cloud where the air is ascending. It then thins and disappears where the air is descending on the leeward side of the wave. The updraft for a wave cloud is, of course, the wave itself. Why is there a bottom to a wave cloud? Because air at that altitude has humidity layers and the air just below the wave cloud is drier than the air that forms the wave cloud … which is why it does not form a wave cloud even though it is traveling up and down in the same wave. The drier air below the wave cloud would have to be lifted much higher before a cloud would form. Basically, my hypothesis is that some of this drier air has been pulled up into the more humid air above it. Because this ascending drier air is not yet at its lifting condensation level, no cloud would form. The result would be a dome of clear air just like in your photograph. In fact, if drier air is drawn up into any cloud base it will make an indentation in the base just like in your photo. Further, an updraft will not cause an downward protrusion. I am not saying I am right. It’s just my best hypothesis subject to being disproved. As I mentioned, I think your hypothesis of precipitation being the cause fails because there is not enough time in a wave cloud to form large enough particles to precipitate either by warm phase droplet collection or by cold phase growth of ice crystals. Thanks Ed…. It’s an interesting hypothesis, but there is one real problem with it if I understand you correctly. You are saying that drier air is being drawn up into the base of the cloud…but I am quite sure that the air underneath the cloud is not drier…in fact it likely has the same dewpoint as the air in the cloud. (If you really wanted to split hairs, the farther you go beneath the cloud, the wetter the air would be from a dewpoint perspective…but for the sake of argument, I can go with air of approximately equal dewpoints.) If it were drier underneath the cloud, then the base of the cloud would not be flat. Look at the cloud surrounding the hole…it is flat. Remember the airflow through the whole cloud is flowing in a wave. It forms a cloud at the base of the cloud shown because as it is lifted to the elevation of the cloud base, it is cooling to its saturation point. The base of the wave cloud represents a temperature surface, not a moisture surface. If the air beneath the cloud were drier, the base of the cloud would be the same concave shape that mirrors the convex shape of the top of the cloud because the airflow would draw up that drier air. If the hole represented a strong updraft, if anything would enhance cloud formation at a lower elevation than the base of the cloud. Think of the formation of a wall cloud in a supercell thunderstorm…the cloud “drops” down from the base of the cell, but it isn’t doing so because of downdrafts, but just the opposite. it is occurring because of increased strength of updrafts. Strong updrafts create a meso-low. Downdrafts create a meso-high, and cause a clearing of clouds. That’s why you get an eye in a hurricane, because of the meso-high in the center of the storm, creating a tight area of descending air. This feature in the wave picture is pretty similar to an eye in a hurricane, and almost has to be representative of a warm spot, and the only reasonable way I can think it could get there is by a column of descending air. It’s been fun tossing ideas back and forth. Thanks for taking he time to swap ideas.